"Know Any Shanties, Paul?" Paul in character. So, by now, all of you should have seen the above picture and are raring to go and see our Paul in his first appearance on the big screen since his mega blockbuster Give My Regards To Broad Street in 1984. It totally was a blockbuster. Anyone who tells you different needs to watch this scene.. It is reported that Paul only has a small cameo in the film, appearing as a Jail Guard for only a minute. 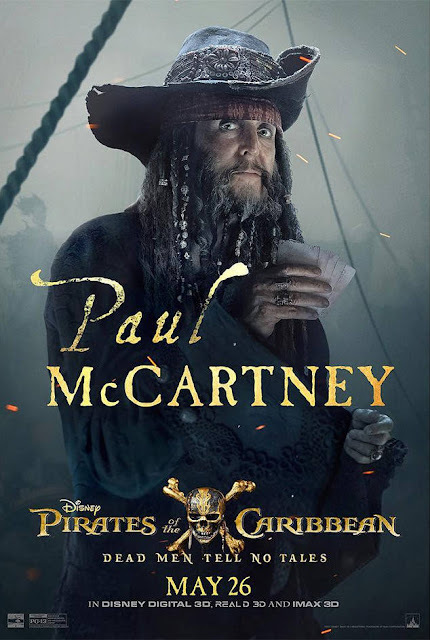 This will be sad news to fans looking for Paul to have a bigger part and according to reports, the cameo was filmed when Dead Men Tell No Tales was in post-production and had to be quickly edited and inserted into the film to meet the deadline. How did Paul come to be in the film? Well, Johnny Depp, who plays Captain Jack Sparrow in all the films, shot Paul a text asking him. After some back and forth, Paul finally said yes to the Pirates life. The film is released on May 26th in the USA.